Is this an anthem still worth singing? 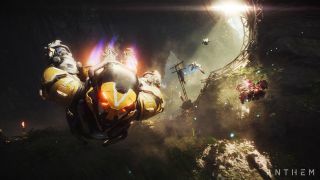 Anthem, BioWare's cooperative, team-based shooter is a change of pace for the makers of Dragon Age and Mass Effect. With a focus on cooperative PvE combat popularised by the likes of Destiny, it landed amid a swirl of hype and expectation, which it has so far failed to meet. Anthem has a big challenge in front of it then – with arguments that its endgame content is weak, its loot system broken and its story not up to scratch when compared with previous narrative-driven BioWare RPGs, it's fighting to win back the hearts of those who were initially in awe of its promise. With EA backing it and BioWare's heritage at its heart, there's hope yet that Anthem will be redeemed. It's being touted as a "living" game after all – one that will evolve over time to keep its fans entranced long after launch – and the likes of behemoths such as Destiny and Fortnite all went through rough launches before becoming gaming juggernauts. So what's the latest Anthem news? When's the next update? And what does the future hold for Anthem? Read on for everything you need to know about the Iron Man simulator. "It is a game of oxymorons and inconsistencies. The story is designed to be single-player but the game is clearly not. The gameplay is an absolute joy but is stifled by the repetitive nature of the end-game. The character animations are truly sublime, but most of the characters themselves are cliché and predictable. "Anthem is a fun game, and a stunningly pretty one, but with flaws in nearly every other aspect of its design. It will improve with patches, updates, and a strong community, but it isn’t a particularly strong foundation. This is less an anthem, and more an annoying earworm..."
EA and BioWare has released Anthem Update 1.1.0 for all platforms. The latest update brings dozens of balance adjustments and fixes, as well as new quality-of-life features. Firstly, the update adds The Sunken Cell Stronghold which is available to all players who have completed the critical path in the main story. Additionally, players can now access The Forge during missions, meaning you don't need to return to Fort Tarsis or the Launch bay to change your gear, and contracts can be selected from the start of the expedition screen, instead of having to go to individual contract boards in Fort Tarsis or the Launch Bay. Finally, new missions can now be launched from the end of the expedition screen without having to return to Fort Tarsis or the Launch Bay. Anthem is a complex game. With four classes to master, a ton of loot to uncover and large world to explore, it can be daunting for a newcomer, and difficult for even a long term player to master. Get ahead of the pack with our selection of Anthem guides, designed to help you get your Iron Man-like Javelin suit fighting fit as soon as possible. Anthem DLC – what's next? Anthem is an ongoing project at EA and BioWare, a game that both companies expect to support for many years, with a player base that will grow and evolve along with the game. How do both teams hope to achieve this? Through regular content drops, that's how. As pictured above, EA and BioWare have already mapped out the "ongoing narrative of Anthem", with updates mapped out already until May 2019. This first "Act" is called "Echoes of Eternity", with March 2019 introducing the "Evolving World" chapter, April 2019 the "Stronger Together" chapter and May 2019 bringing the ominous sounding "Cataclysm" chapter. Evolving World will focus on battles with huge bosses such as Titans of War, Ruin, Bane and Havoc in freeplay mode, as well as new Legendary missions and a Scar Infestation freeplay event. Stronger Together will expand the endgame with a new Mastery System for the skill tree progression, as well as host of new freeplay events, more legendary missions, a new Stronghold called "The Sunken" (which will have its own weekly challenge) as well as the introduction of leaderboards and guilds. As for what the Catyclysm brings, little is known at the moment beyond the promise of new freeplay events, missions and new items. We'll presumably find out more as the year rolls on. But what about paid DLC? EA has yet to announce it's mid-to-long term plans for Anthem. We'd expect it will follow a similar path as Destiny, which had a continued supply of small improvements and features added, interspersed with larger paid-for DLC packs, before an eventual sequel. That is, of course, if Anthem can prove its staying power... Here's hoping – there's a gem at the heart of Anthem, waiting to be dug out. We're hopeful that we'll one day be playing Anthem at its strongest.